This interface provides access to locale specific calendar systems. It is derived from com::sun::star::i18n::XCalendar and provides additional functionality to display parts of the date currently set at the calendar. Returns a string (number or name to display) matching the given code constant. Note that the string returned depends completely on the locale's calendar. It is not predictable if the string will be numeric or a name, or if in case it returns a numeric string how many digits that will have. For example, a short year display string will normally be two digits with a Gregorian calendar, but with a Jewish calendar it will have three digits. This argument designates the basic transliteration mode as if specified for the year representation. However, depending on the locale, different conversions for year and month, for example, may be chosen internally. 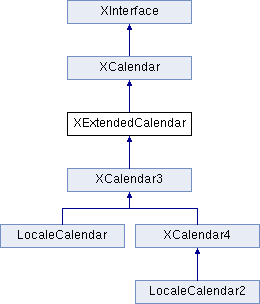 This is beyond the user's control and depends on locale specific conventions of how a date is assembled.